Interactivity: You want to be sure that the activities within the lesson provide numerous opportunities for students to practice the skills they need. Consider whether there are multiple pages with a variety of different types of interactions so that all of your students have an opportunity to participate and practice. Aesthetics: Just like any other materials you use with your students, the lesson pages should be neat and clean. Lesson pages should be uncluttered and with space used effectively. Add or look for attractive use of media, line, space, shape, texture, and color within the lesson. Instruction: Lesson pages should be sequenced from easy to more difficult with increasing interactive opportunities. Look for learning objectives within the lesson that are student-focused, observable, and measurable. The learning objective should define learning so that your students know and understand expected outcomes for that lesson page. Lesson pages should also provide meaningful and relevant feedback for correct and incorrect answers. Originality: Originality is the wow factor. Do you open that lesson page and think “I can’t wait to use this lesson with my students!” It’s important that the look and type of interactions with lesson activities vary, so you want to be sure to mix it up. Collaboration: Lessons should include opportunities for multiple students to work together, whether using a collaborative feature within IWB software or lesson design that allows students to partner up in order to problem solve. 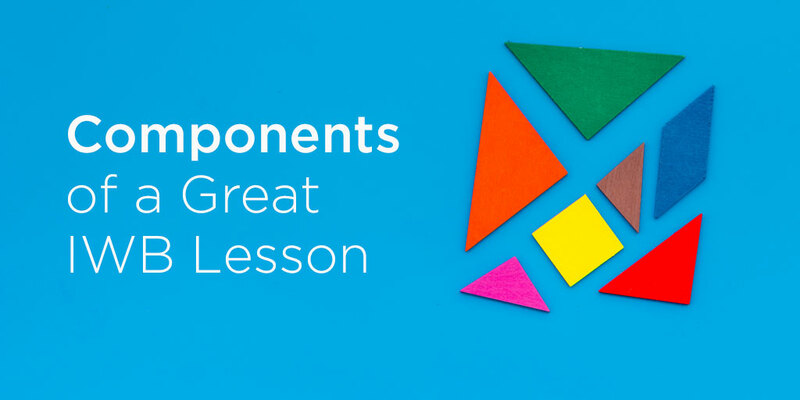 Now that we have defined the components, let’s take a look at these sample lesson pages as a frame of reference, as well as how the design components are applied in these pages. Interactivity and Instruction Applied: All three pages provide fun and engaging interactive practice for beginning sounds, but the type of practice opportunities are varied. On the first page, students drag and sort the images into the box with the correct beginning sound. The correct answers appear under each image for checking. On the next page, students use the pen tool to circle the pictures with the beginning sound that matches the letter presented. Once complete, students click on the arrow at the end of each row to reveal correct answers. On the third page, students drag the correct cloned letter box and place under each picture, then click on the picture to reveal the correct answer. All three lesson pages have an objective in the top right corner that slides out and is student-focused, observable, and measurable. You’ll also notice the number of interactive opportunities across the pages. Aesthetics Applied: Looking across all three lesson pages, you will notice that the colors are crisp and work well together. The pages are all neat and clean with a consistency in design, while the activities on each differ. Originality Applied: I don’t know about you, but I can’t wait to use this lesson with students! It looks bright, fun, and inviting. This template also works well for many other types of lesson content such as properties of real numbers, fact families, mixtures, types of sentences, or three-dimensional shapes, just to name a few. Collaboration Applied: For this lesson, there are a number of options for collaboration based on whether your hardware allows for multi-touch or the software you are using has the option for collaboration. Bring multiple students to the board to complete the activity working together or push the lesson page out to student devices for teamwork. Follow up with a blank page to allow students to apply their learning. Remember, take it one step at a time. Start by finding lessons that are high-quality, fun, and engaging for your students. Begin to identify the components of those lessons that make them great, then slowly but surely you will be ready to create your own. You can start small, maybe even modify an existing lesson using new content to make it your own. Before you know it, you’ll be creating lessons that your students love. You can do it! Want to learn more about designing quality lessons? Join us for the free MimioStudio: Putting Instructional Design to Work Quick Learn session. Click here to register and see all our Quick Learn sessions: https://mimio.boxlight.com/quick-learn-overview/.